Well, we have to say it’s been a pretty good year. Great, in fact. We’ve had great yields, smoother workflow, more participation, but more importantly, we’ve deepened friendships and our reach into Spanish Lake. We are broadening the roads into the Bel-Ridge community as well. Before we get into the numbers and finality of things, many thanks are in order. To our subscribers- for taking part, the feedback, the friendships, the help, the gratitude, and the fun. To our administrators and colleagues at CAASTLC, in particular Georgie Donahue, for her endless devotion to the program and guidance. To St. Peter’s Lutheran, Pastor Paul and affiliates of Bethany Peace, Eden, OFS, Lincoln U, Helping Hands, Global Compassion Ministries and SLCA for help in innumerable ways. Truly, we thank you all for the daily gifts that we call our work. Sometimes it feels like I happen to be in some conductor’s seat, visible to all, and these two are the motor really keeping the train rolling. That is in a sense true, but so lacking in describing who we are and what we do. Both Randy and Whitney are creative and thorough thinkers who keep me, workflow, and the farm in line while expanding its potential. They are both also really, really good and devoted, capable people who happen to be a whole lot of fun. I look forward to seeing these two every single day- a work situation in which very few find themselves. I am deeply grateful for a season of growth alongside both of them. Whitney brought a practical set of skills different from my own, put up with me day in and out, created and fixed so many systems we now use, worked even when I could not, and did it well, brought fun and friendship to all of us on the farm, and likely taught me more than I taught her. Randy again was both a backbone and a clutch. From exercising skills and patience I don’t possess-like running our website, providing technical growing advice, building the tables and helping on the farm, creating promotional materials, always offering solid, clear thinking and communication, expanding the program at Bel Ridge, even the vital packing and delivering every Friday…which sounds much easier than it is. All in addition to being the Community Garden Coordinator. Yes, we plan what we are going to grow. Where we will plant it, when, and how much. We also record what we harvest, what we lose, and where it all goes. Sometimes we even write down who said what at lunch. And what we ate. And yes, dear, pun– ished reader, we are also aware of the poorly chosen double entendres on veggie names that have found their way into your weekly read. We don’t know what you eat, but we know what you get from us. Below is some breakdown of what went into your share. If you are interested in a list of totals you received for the year, how we calculate values, etc, please contact me and I can email or mail you a list. Below are yearly totals of a few crops received by weekly subscribers. Bi-weekly members, your shares quantities and values are almost exactly half of those listed. 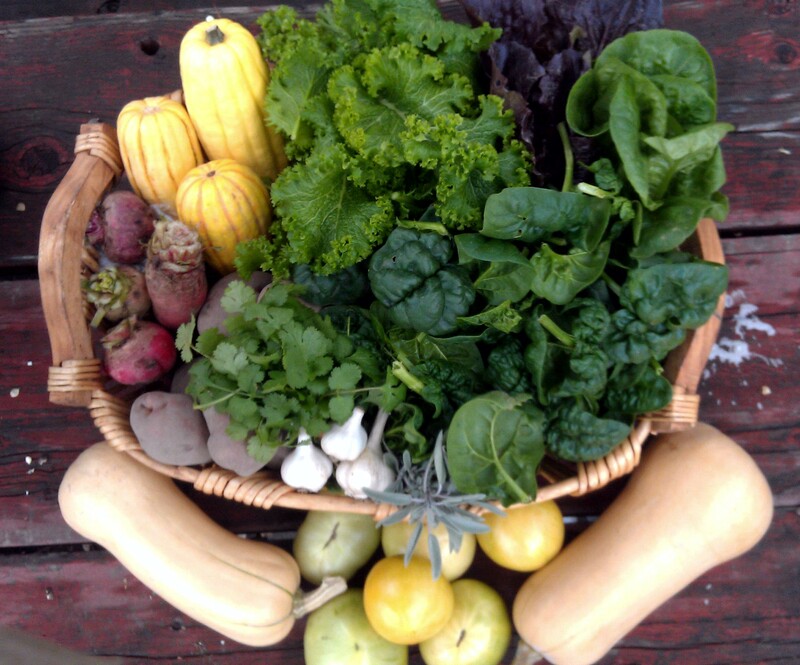 We do wish we could have offered more cabbage, kale, and larger amounts of summer squash. Those were crops we struggled with this year, but have better plans in place for 2014. Our potato yield wasn’t what we’d hoped. With the above struggles, that’s why we held them back for late shares- to still give a full bag in case fall brassicaes etc. didn’t come through. And it worked out. Even with those losses, we surpassed the targeted 28 week value of $560. Thank you for returning your surveys. Everyone have a wonderful winter, and we will see you in 2014. In January and February we will be signing up members for the 2014 season. We want to give you, our current subscribers, first go so contact us now if you’d like to reserve your spot. We will put you on the list. This Week’s Recipes… were brought to us by Operation Food Search, who credits allrecipes.com for their sourcing. We had this awesome dish at a food demo with OFS this week at CAASTLC. Does it sound like a strange combo of ingredients? Yes. Does it taste strange? No way. Purely awesome. We didn’t worry about saffron, almonds, lemon, or some of the smaller things, but did use fresh cilantro and sour cream. Delicious and filling. Add squash and potatoes, season with salt and freshly ground black pepper, stir to coat, and cook until just tender, about 3 minutes. Add broth, chickpeas, tomatoes and their juices, and saffron, if using. Bring mixture to a boil then reduce heat to low. Cover and simmer until squash is fork tender, about 10 minutes. Remove from heat and stir in preserved lemon and olives. Serve over couscous garnished with cilantro, almonds, and yogurt. Next Post Happy New Year from Seeds of Hope Farm! Please check out our new flyer and share it with a friend!